What do Little Red Riding Hood, Three Little Pigs, and The Boy Who Cried Wolf have in common? Besides being folk tales, they are known for the iconic character of "the wolf". Now you can dress up for any Fairy Tale party in this adults Wolf costume. 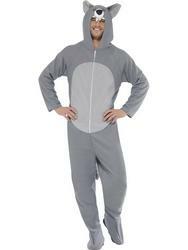 This easy-to-wear, comfortable grey zip up jumpsuit comes with a hood that displays wolf nose, eyes, and attached ears. You'll be dancing with the wolves while howling at the moon when you appear at an Animal themed fancy dress party or for World Book Day!